The Time’s Arrow Festival is Trinity Church Wall Street’s annual festival of January concerts. The 2017 Festival takes place January 1st – 12th and celebrates the 250th anniversary of the opening of St. Paul’s Chapel, the oldest church building in Manhattan. 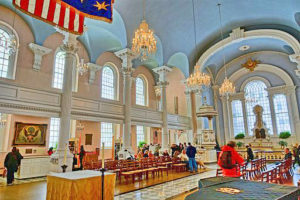 The festival features free concerts held at St. Paul’s Chapel. The 2017 concert calendar includes music heard in Lower Manhattan from the days before the construction of St. Paul’s Chapel to the present day. The concerts provide an opportunity to enjoy first-class musical performances free of charge in a beautiful historic church setting. Concerts are held daily throughout the festival. See the full concert schedule. St. Paul’s Chapel, located at Broadway and Fulton Street is part of the Trinity Wall Street Parish and is where many of the festival’s concert events are held. St. Paul’s Chapel was constructed in 1766 and is the oldest public building in continuous use in New York City. The Chapel survived the World Trade Center attack of September 11, 2001 without even a broken window, despite the fact that the rear of the church is located opposite the east side of the World Trade Center. The Chapel served as a place of rest and refuge for rescue workers in the months following the attack. Trinity Church Wall Street is located at Broadway and Wall Street, a few blocks south of St. Paul’s Chapel. The current building was constructed in 1846 and is the third constructed on the site. The church contains some of the oldest stained glass in the United States. The church’s set of 12 change-ringing bells rotate 360 degrees and produce a shimming, complex combination of tones. The church hosts a variety of free musical performances throughout the year. Alexander Hamilton’s grave is located in the churches cemetery.